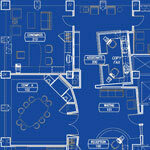 Planning and programming a project depends entirely on its size, intended use, location and budget. Whether we remodel a bathroom, design and build a new home or create a corporate facility, we always consider our work in the context of its surroundings. Site design, documentation of requirements, development of "best fit" scenarios and identification of design and structural alternatives are among the steps we take. Business environments require strategic planning for near to long-term space use, workflow effectiveness and capital spending. The program resulted in groupings of offices interspersed with "nodes" for administrative purposes. Circulation from entry to the farthest point is about a city block in each direction. The "nodes" have ceilings and lighting different from the hall sections. These plus angled features add interest to this pathway and provide opportunities to display corporate artwork.